Place 1/2 tablespoon of coconut oil into a large cast iron or non-stick pan. Cook the onions over medium heat for 3-4 minutes. Remove the onions and set aside. Add 1 tablespoon of oil to the skillet increase temperature to medium-high. Once the pan is hot, add 1/2 of the okra and 1/4 teaspoon kosher salt. Sauté for 10 minutes. Stir occasionally. Remove the okra and add to the onions. Add the second batch of okra to the pan (add a bit more coconut oil if the pan is dry). Cook for 10 minutes, stirring occasionally. Add the onions and okra back into the pan. Stir to combine. Add the Worcestershire and vinegar to the pan. Cook on medium-high until the liquid is reduced by half. Remove from the heat. 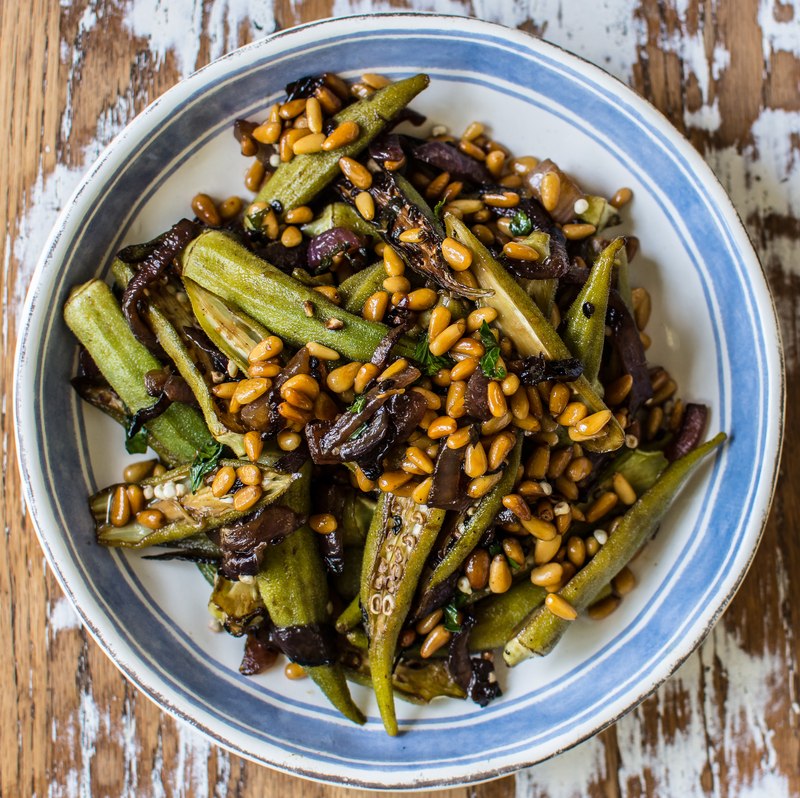 Stir in the parsley, basil, mint and toasted pine nuts. Stir well to combine. Salt to taste and serve immediately. To toast the pine nuts: Heat the oven to 400 degrees. Place the pine nuts onto a rimmed baking sheet. Cook for 5-8 minutes, shaking every 2 minutes. Remove from the oven when golden. This entry was tagged A Pleasant Little Kitchen okra recipes, A Pleasant Little Kitchen warm okra and red onion salad, dallas food blog, dallas food blogger, okra, okra and onion salad, okra and pine nuts, okra salad, texas food blog, texas food blogger, warm okra and onion salad, warm okra and red onion salad. Bookmark the permalink.